Dubai, UAE; 15 August, 2018: 2XL Furniture and Home Décor, leading luxury furniture and home accessories brand in the UAE, has launched their stylish Nicola dining table and chairs designed to make dining an experience to be cherished. The set consists of a stunning grey and golden dining table and six chairs, all made of fine beech solid wood. The chairs are cushioned and stylishly designed with golden tinge on the edges. The dining table legs are a classic style with golden colour rims. Nicola dining table and chairs are perfect for a great meal with friends and family as it provides elaborate space for table decorations, and multiple dishes. 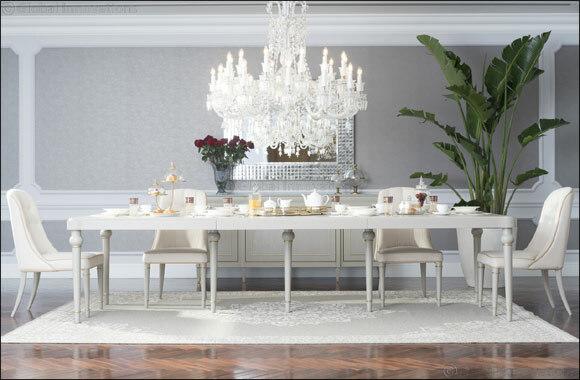 The dining table is available for AED 6,296 and the chairs are available for AED 1,194 per chair.